Commonly referred to as "Ecuadorians" or "Es", though this is a misnomer as they come from Latin America and parts of Southern California! The following is based on what I've noticed my Compressus to enjoy the most. Compressus tend to enjoy themselves the most when their environment has a temperature of 75-80 degrees Farenheit/23.89-23.67C and a humidity of 75-80%. A mixture of clean playsand and Eco Earth (Coco Fiber) is enjoyed by the compressus. Though, straight playsand will work, it is not ideal. It is not suggested to use straight Eco Earth for any species. Because of their shorter & fatter tails, shells that have a D shaped openings are often favored by compressus, though they will also use turbos and are known for being very picky about shells. It's important to feed your land hermit crabs a wide variety of fresh and organic foods. A few favorites of the compressus include: coconut, roses, various types of seaweed and fish. Each compressus should be able to dip their shell opening into a pool of dechlorinated fresh water and salt water. It is important that compressus have access to an ocean grade salt water at all times. Coenobita compressus are very active if kept in the right conditions. A few of their favorite things to play in are: moss pits (they also enjoy to munch on the moss), cholla wood, and coconuts. Compressus are often referred to as "tank trashers". They love to dig just for the fun of it and climb on anything they can get to (do not underestimate their climbing abilities - they even climb the silicone in the corners of aquariums! ), and they enjoy the occasional dash across the tank. 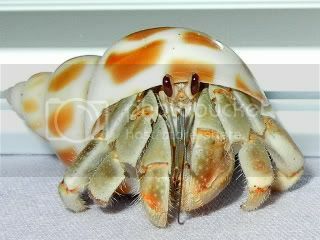 They're the only crabs that can move the same speed in any direction, including going in reverse! Although in the wild crabs naturally segregate by species about 98% of the time, c. compressus can be kept with c. clypeatus and c.bruneus with fairly good results.